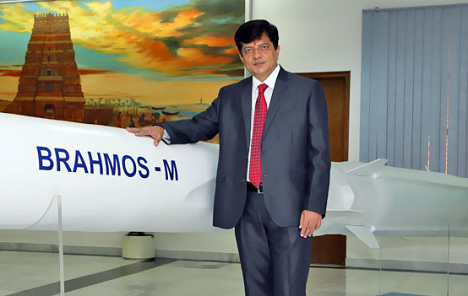 In the second part of his interview with RIR, the new BrahMos chief executive talks about his close relationship with Russia, India’s Project 75 and the development of the mini version of the BrahMos missile. What do you think about the possibility of replicating the BrahMos Aerospace JV model in other areas between India and Russia? First, I would like to convey to you that when I land in Moscow Airport, I feel that I have come to my second home. I have lived there for four years and I must have visited more than 20 times after that. I love the country, people and their culture and when it comes to successful joint venture, then I want to tell you that BrahMos is “THE” only joint venture in the defence sector anywhere in the world which enjoys this much success. This is because of the technology strength of both the countries, trust which we have posed in each other, confidence and our track record of meeting our commitment and commitment of delivery, meeting the dates and I feel that this joint venture has a great future. Many countries, they talk, they want to replicate BrahMos but you cannot copy the template. You can follow it up to a certain extent but the true spirit between India and Russia, it can exist only between Indians and Russians. It does not exist between any other country in the world. Russia is going to participate in Project-75 India (P-75 I) tender, which entails the acquisition of another six submarines for the Indian Navy? Russian submarine will come along with BrahMos missiles installed. When do you expect this competition to happen? We have demonstrated the capability of BrahMos by launching from a pontoon. Users have observed it, they have taken note of this and I am sure the kind of confidence users have shown in our other products, they would show in the submarine launch as well. Apart from this, we are going to develop the BrahMos-Mini as well. So BrahMos-Mini can be launched from a torpedo tube. We are planning, we are designing to do it from the torpedo tube. So it can be used there also as a standard weapon in all kind of submarines and users have to make up their mind what kind of weapon system they are looking for and we are telling the users that this is the weapon on the table, kindly have it. So RFP is not yet released. Let us wait and see. Did you get the approval for this BrahMos-M (mini) development? Not yet. It is under process. When do you expect to get it? I wanted it yesterday and I am chasing it to make it happen. I am sure DRDO has complete trust in this project and I bring that spirit from DRDO to BrahMos. So I am sure it would happen soon and you see it is science and technology. So it is very difficult to predict the duration, the time but I always feel that, I am very bullish about it, very optimistic, it should happen at the earliest and that is going to be my priority. How much time would it take to develop this missile? It should not take more than three years. The basic missile would be same and it would be adopted to meet the requirement of the services but the basic model, the basic financial managerial model which exists between India and Russia would be same, we would work on the same proportion. We would hold hand of each other in a similar way. It will be universal missile for Army, Air Force, Navy. It can be adopted to meet any requirement. You need to sign some more documents with Russia for BrahMos-M also, don't you? We would once finalised will have a Tripartite agreement between DRDO, NPOM and BrahMos. It would be like a wish to work together, a basic agreement, which will suggest three organisations are ready to start developing this missile. We hope to sign it by the year end. What is this time needed for? The reason is we are doing a feasibility study. We are studying whether the specifications are right or not, what all can be done, what we can do, what Russians can do. So before any big project, we need to sit and talk. So we are sitting and talking. We are evaluating the scientific parameters of various subsystems. It takes time. Now there are many Indian tourists who are coming to Russia. What was the most interesting part of Russia for you? For a tourist to come to Russia is its natural beauty and I pray that Russians will preserve it the way they have been preserving it, number one. Number two, the museums and church cathedrals in Petersburg, canals in Petersburg are very beautiful. Third, you have got all the resources in abundance. You have almost everything, sunshine, snow and for a tourist going from India Baikal Lake is the ultimate beauty. More than that, you see India and Russia have almost more than 70 years of relationship and the image in the minds of Indian people is that Russians are our true friends. So when they go if they go to Moscow, if they go to different places, they feel at home that yes, we are in the friend's home, nothing to fear about it. You are new BrahMos chief now? Any missile dreams? Yes, you see I worked in Hyderabad where the technology development for BrahMos has been done. I have been a member of the technical teams who have developed the technology for BrahMos from DRDO side and then I worked as a Programme Manager in the BrahMos project in DRDO. Then I visited Russia and there, I have conducted the visit of then-Indian President Dr. Abdul Kalam to Moscow, taken him to NPO Mash and conducted the visit of Defence Minister of India again to NPO Mash. This feeling, this attachment, it created some kind of dream in the mind that it would be ultimate happiness, it would be ultimate professional dream to lead such a high technology programme in the world and for a mechanical engineer like me, nothing can be better than leading a team of experts who are world class, who are best in their profession who know how to deliver, how to meet user’s aspirations, it is a dream come true. I have witnessed the commitment, the courage, the endeavours of Indian specialists and Russian specialists, both. It gives me great satisfaction of being their leader and take BrahMos to a step up. More business, more technological challenges, early delivery, find a better way of doing the supply chain management. This itself is a lot of work.